So, the Corsair Force GT is really going against OCZ Vertex 3? I thought it was agains Vertex 3 Max IOPS. In this case, the Corsair Force 3 is going after Agility 3? And Corsair Performance 3 is going after Solid 3? There are some factors that were not considered on the first page of the article. The number of dies per wafer is important, but you are forgetting the cost of producing a flash memory wafer vs a VLSI wafer. 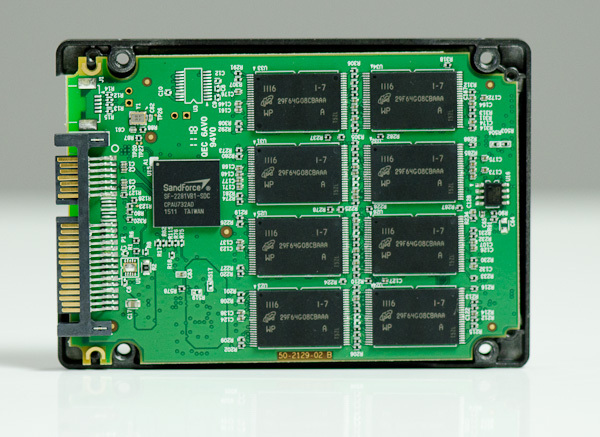 Flash memory is a ~20 layer process that has margins for error which can be worked around. VLSI is a 60+ layer process that has 0 margin for error. Producing flash memory wafers is more than an order of magnitude cheaper than producing the same-size VLSI wafer. Additionally, turnaround time on a flash wafer can be achieved in ~20 days, whereas a VLSI wafer can require 3 months. I don't want to blame the victims, end users. Obviously, manufacturers have a responsibility to QA. Still, when you look at the market forces here, it seems obvious that market forces are driving the problem. Manufacturer makes the COOL drive that gets the best performances marks of any drive out there. One year later, the COOLER drive is released. No one wants a COOL drive anymore. Plus, the margin making COOL drives is so small, you can't drop your price on a COOL drive to make it an attractive "midrange" option. So you have to start developing a new controller to make something down-right freezing. Because there's such an emphasis on performance, controllers and the drives they run become obsolete before a water-tight reliable version of the controller can be made. Of course, they're not really obsolete--there's nothing wrong with the X-25M controller--but they can't compete in a market with drives that show twice the random read performance of an unreliable competitor. Glad you noticed that warranty term because it's somewhat related to topic of this article. I've been in direct contact with Anand on this as the tone of article is all-encompassing and I wanted to shed some light on that from our perspective. While many SF based SSDs share firmware, not all hardware is the same. Our SSDs have subtle design and/or component differences which is what we feel reduces or eliminates our products susceptibility to the BSOD issue. The honest truth is we have not been able to create a BSOD issue here with our SSDs using the same procedures that caused other brands' SSDs to experience BSOD. Nor have we received or read one direct report of such an occurrence using our drives. And while we cut our teeth so to speak in the Mac industry, PLENTY of PC users have our SSDs in their systems...as well as that we do extensive testing on a variety of motherboards/system configs to ensure long term reliable operation.